The amusing tale depicts what would happen if pet and kiddo could engage in silly conversations. In true Dr. Dolittle fashion, this children's book translates barks, meows, and pounces into Pet-lish (that's pet English). 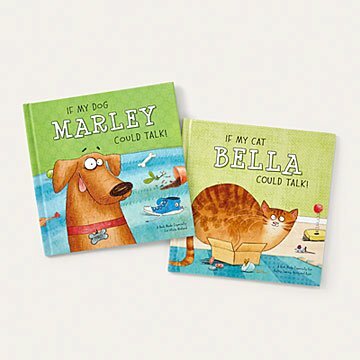 Personalized with the name of your little one and their four-legged sidekick, the amusing tale depicts what would happen if suddenly they could engage in silly conversations. It's a magical keepsake that will have them howling—or purring—with delight. Made in Minnesota. I ordered this book for my toddler who is obsessed with our dog and loves books with bright colors and goofy characters. The book is well written and illustrated, fantastic quality and something I hope my son will keep for years to come. One caution when filling out the info is that when they ask you to list "other people who love the dog/cat" just know that these people will be mentioned on every single page rather than secondary characters as I expected them to be. I listed everyone in our household but when I read the book I wished I kept it to just my son. I have a very cute picture of my son-in-law, Jason, reading the book to Palmer, our granddog. Fun gift for any child who loves their furry family member. This is the perfect book for my niece to to read to my great niece. It clearly describes the love and wonder between a doggie and a new sibling and their adventures together. Our family loved the personalized book! The drawings resemble our dog so much and the words are sweet. Our puppy is getting old so I am sure this book will endure as great memory as our toddler grows. Very good quality materials, art, and story. This idea is so cute, however the actual book is a letdown. I chose dog #9, the one that looks like our dog. He actually has 3 different looks and colors that make it look like a different dog from page to page. I contacted CS about this issue, they agreed and sent out a new book. The new one is exactly the same. After reaching out again to CS, they told me the artist said these inconsistencies are just the way dog #9 looks and cannot be changed. If you can't really customize the dog, what's the point of the book?